There's an interesting thread going on over at Model Horse Blab about "what is your holiest grail?" Every Breyer collector has a model that got away, one that was priced too high to afford, or one that was exceptionally rare. One of the answers cropping up often in that thread is "Merlin," which I had never heard of. I did some research and found that Merlin was based on the American Saddlebred Stallion mold, which was created by Kathleen Moody in 2000. This is a very dramatic mold, with a posture showing a lot of flexion, and Moody's classic highly sculpted mane and tail. The mold itself practically counts as a fantasy model, which I think is part of what makes Merlin such a successful variation. 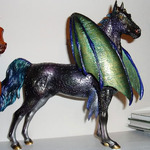 Read more about Super-Rare Breyer Model: "Merlin"
QuarterFest Gloss Dapple Gray "Smokin Hot Chic"
Breyer has announced another special model, and the collecting world is on fire about this one! This is a glossy model, which seems to be a little more rare than the matte models. The glossy models always cause a big stir among collectors, partly because that high gloss finish is a real eye catcher! Dapple gray is always a difficult color to pull off well. Certainly Breyer has some historical versions which were… let's just say "not realistic." Some of the earliest dapple grays were just gray horses which had been flecked or dotted with white paint! Read more about QuarterFest Gloss Dapple Gray "Smokin Hot Chic"
Hi I am moving and thinking of selling my collection of Breyers. I am thinking of ditching the boxes that Ive held onto for years in order to store the horses easier. If i am to sell my horses later on down the road, will I regret pitching the boxes? Will they sell for more if they are with original box? What if the box is not in exceptional shape but the horse is? Any suggestions will be a huge help!! 2000 Breyerfest Raffle Horse Showboat up on ebay! 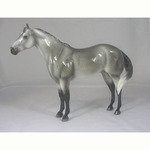 I recently put my 2000 Breyerfest Raffle Horse Showboat on ebay. It has about a day left if anyone is interested! I won it myself at the fest. There were 25 raffled off and this one was the last one raffled. Read more about 2000 Breyerfest Raffle Horse Showboat up on ebay! Breyer has announced a Limited Edition model for BreyerFest: Radar, who at 19 hands and 3.5 inches high, is the world's tallest horse. Radar was certified by Guinness World Records for the years 2006 through 2009, before his recent retirement. The Breyer Model Horse company donates a commendable amount of time and effort to various horse-related charities, and the ECLR Benefit Model is an excellent example. The Equestrian Land Conservation Resource (ECLR) is a group which is dedicated to preserving open land for equestrian use. A percentage of the sale of every ECLR benefit model goes to the ECLR, to help keep riding trails and land access available to horseback riders. The ECLR is an umbrella group, and local groups can apply to be beneficiaries of the $10,000 annual ECLR Breyer grant. Has anyone seen this available yet? It is a light sorrel Proud Arabian stallion and rider, both in Arabian costume. Pics can be seen on the BMHR website, under Identify Your Models-there is a list of topics on the left, and one of them has this new set. I'm assuming it will be like the Flamenco set, with a price tag of over $100. I HAVE to have this!!! Another new model being introduced this year is a Classic sized Horse & Rider gift set, "Reining." From what I can make out of the blurry scan I found online, "Reining brings the spirit of the American West to the 2010 Alltech FEI World Equestrian Games." The male rider, dressed in Western gear, is reining his palomino American Quarter Horse in a dramatic sliding stop. The mold being used for this set is none other than Hollywood Dun It, one of the most popular Classic molds produced in recent times. Read more about Please help identify? 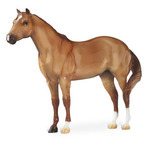 Walkabout Farms is one of the oldest and most extensive retailers of Breyer horses. 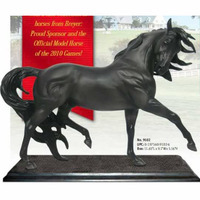 According to their site's About page, the owner's personal collection numbers over 3,000 Breyer models! In addition to a physical store in Ohio, Walkabout Farms runs one of the most comprehensive online Breyer model stores available. Therefore it may not be so surprising to learn that Walkabout Farms has commissioned an exclusive special edition of the Strapless model from Breyer, which they are currently offering as a pre-sale. Many retailers commission special Breyers, from Walmart to Petco to Tractor Supply Center. But so far as I know, this is the first case where a dedicated Breyer retailer has its own model for sale. New Breyer Models: Porcelain Esprit and More! Some early news has snuck out about the new mid-year Breyer models, along with a few leaked scans of the marketing material. Some of the biggest buzz centers on the black porcelain Esprit (pictured at left). Collectors are a little skeptical of this Esprit's flat coat color, which is solid black from stem to stern, not a white snip or blaze or stocking in sight. This certainly marks a significant departure from Breyer's usual coloring policy - so significant that many people are speculating that this collectible Esprit is actually made of black porcelain. Being made of black porcelain would definitely account for the solid color, and it would fit with the exclusive collectible nature of the model. Black porcelain is far rarer and more expensive than regular white porcelain, and lends the model a more sculptural look and feel. Read more about New Breyer Models: Porcelain Esprit and More! What do I do I am at a loss? Read more about What do I do I am at a loss? Looking for Breyer Horse Seattle Slew #474 new and in original box.